Today, I'm reviewing Light in the Piazza (1962) starring Olivia de Havilland (left) and Yvette Mimieux. 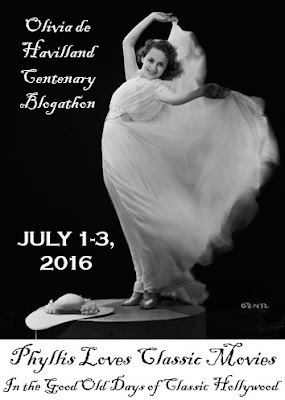 This article is part of the Olivia de Havilland Centenary Blogathon hosted by Phyllis Loves Classic Movies and In the Good Old Days of Classic Hollywood. Olivia de Havilland's beautiful performance in the family drama Light in the Piazza (1962) is one of the hidden gems of this old Hollywood legend's career. The actress' nuanced portrait of an over-protective mother is as complex and richly rewarding as her work in better known films, such as Gone With the Wind (1939) and The Heiress (1949). Light in the Piazza tells the story of Margaret Johnson (de Havilland), a wealthy American woman who is taking her intellectually disabled adult daughter, Clara (Yvette Mimieux) on a tour of Italy. The impressionable Clara meets and falls in love with a handsome Italian man (George Hamilton), but Margaret worries that any future between the couple will be hindered by Clara's childlike nature. However, when Clara's father (Barry Sullivan) starts planning to have her institutionalized, Margaret puts a plan in motion that will save both her daughter and herself. Light in the Piazza is based on a short story by Elizabeth Spencer that first appeared in The New Yorker. MGM quickly snapped up the rights for a lavish movie adaptation that was helmed by longtime studio producer Arthur Freed and featured a script from Casablanca (1942) screenwriter Julius J. Epstein. Freed also assembled a stellar cast of old Hollywood veterans (de Havilland and Rossano Brazzi) and promising newcomers (Mimieux and Hamilton). 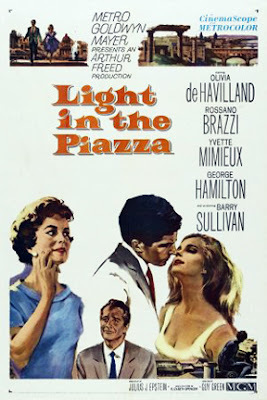 Light in the Piazza was filmed on location in Florence and Rome, and the movie is well worth watching for its travelogue scenery alone. Viewers are treated to long scenes in such iconic locations as the Piazza della Signoria and Uffizi Gallery in Florence and the Via Veneto in Rome that are beautifully photographed by director Guy Green and cinematographer Otto Heller. The movie is also a fashion feast for the eyes: De Havilland looks effortlessly chic in her custom Christian Dior creations, and Mimieux is stunning in her sixties glamour girl attire (I particularly love the butterfly skirt she wears in one scene). 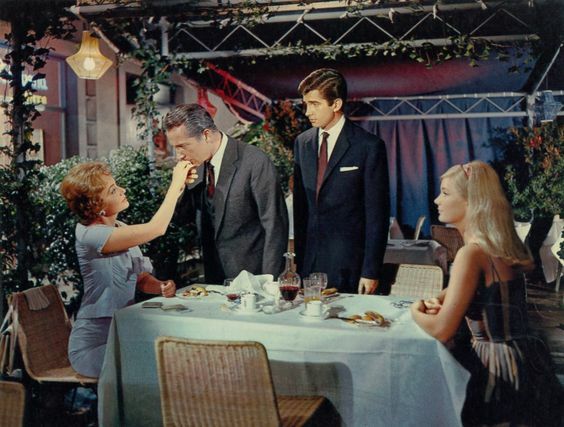 Olivia de Havilland (left), Rossano Brazzi, George Hamilton, and Yvette Mimieux in a scene from Light in the Piazza (1962). Despite all of the glossy exteriors, Light in the Piazza is a film of substance. There are good performances all around especially from Brazzi, who comes off as a more opportunistic version of the character he played in Summertime (1955), and Hamilton, who is irresistibly charming even though he plays his role like a younger, more tanned Chico Marx. However, this film belongs to de Havilland, and she brings her exquisite, understated style to every scene. Other actresses might have portrayed Margaret as an overbearing helicopter parent, but in de Havilland's hand all of her actions are perfectly understandable to the audience, whether she is trying to cover for one of her daughter's embarrassing public tantrums or flirting mildly with Brazzi. In many ways, Margaret is reminiscent of de Havilland's earlier screen triumphs. The Johnsons are from North Carolina, and Margaret is every inch the steel magnolia a la Melanie Hamilton in Gone With the Wind, but Light in the Piazza is more closely tied to de Havilland's Academy Award-winning tour de force in The Heiress. While the earlier film focused on the innocent young woman, Light in the Piazza is more concerned with the older generation. In several key areas, Margaret is similar to the character Ralph Richardson played in The Heiress: Much like Dr. Sloper, Margaret is a smothering parent who will barely let her child out of her sight, and she also has Sloper's bad habit of magnifying her daughter's minor personality quirks into major flaws. Unlike Dr. Sloper, Margaret has the ability to change, and she learns to see her daughter with fresh eyes after seeing the love and acceptance she receives from her suitor and his large family. TCM will air Light in the Piazza at 12:15 a.m. July 30 (Friday night/Saturday morning). It is also available on DVD and video on demand. Great review - nice to see a film from later in de Havilland's career getting some attention, and the setting and storyline both appeal. I'd love to see this - the DVD's not available in the UK, but maybe it will turn up here on TV or streaming some time. I had actually never even heard of this movie until I stumbled across the Broadway musical. It really is a hidden gem. Your review has piqued my interest and I will be sure not to miss the opportunity TCM is presenting. I wish they were showing it in prime time, but you can't have everything. I really like this film and I agree with your assessment re: Olivia's performance. With a different cast, this film would be far too melodramatic for my taste, but I think the actors save it, especially Olivia. Like you said, she makes it perfectly understandably why she chooses the things she does. Really a terrific performance. And a great review, too! It is one of the hidden gems of Olivia's career. What a wonderful review. When I first saw the movie, I had trouble accepting the mother's motives, but I came to see that she was trying to do the best for her daughter. I love the final scene where she keeps repeating "I know I did the right thing." Watched it last night :) Mimieux was perfect in her role! Her face really had that child-like quality and innocence. And anyone but Olivia would have been a difficult character to like. This sounds so, so familiar -- I feel like I've seen part of it, long ago. I'd like to see the whole thing some time, as you make it sound so good!